One of New York's best collections of pinball is hidden in a secret bar in the back of this laundromat. Walking past Sunshine Laundromat, one might assume that unless they had a load of dirty laundry to do there would be no reason to wander inside. You would be mistaken. A museum devoted to bringing to light forgotten or neglected histories through exhibitions, education and public programming. 19th century cemetery hidden in Brooklyn's Prospect Park. Once a ferry dock, radio transmitter, and now a new Greenpoint park. As you pass a few classic pinball machines and go through the row of washing machines you notice a strange stack of washing machines at the very back of the laundromat. Come closer and you realize that through those back washing machine doors it’s not laundry that you see but another world. A world of pinball. For years the Sunshine Laundromat was simply a local laundromat with an odd sense of humor. 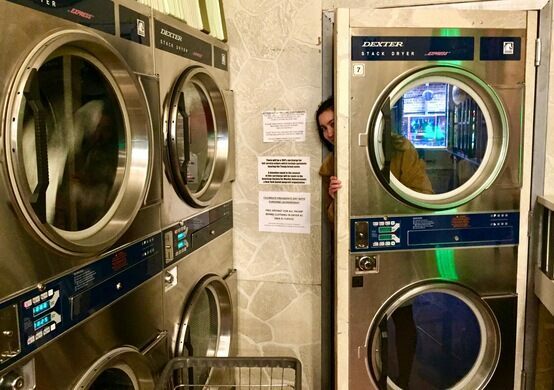 Signs outside read “Try our gourmet vegetarian washing machines and vegan dryers.” However when Peter Rose, a 42 year old lifelong New Yorker and pinball enthusiast, teamed up with the building owner’s son Michael Medovoy the business began to transform. Sharing a deep love for mechanical devices in general and pinball in particular (both men had managed to cram pinball machines into their respective dorm rooms in college) they began to fill the laundromat with classic pinball machines. As pinball machines threatened to outnumber washing machines, Peter began working towards his lifelong dream of owning a proper pinball venue and the next phase of Sunshine Laundromat was begun. It began by transforming a 1000 square foot storage room into a working bar with a glassed in atrium. The next step was acquiring a beer and wine license. With their paperwork completed in early 2016 Sunshine became the only laundromat in New York City that can legally serve alcohol. Lastly and most importantly Peter, who maintains a collection of nearly 200 pinball machines (and services pinball machines around the city), chose which of his collection would go into the bar. He chose only the best. A pinball Valhalla was born. A destination for any lover of pinball even the bartenders are pinball pros. Bartender Alberto Santana is ranked 88th in the world by the International Flipper Pinball Association and is happy to share some advice on how to up your score. Upfront the washing machines and dryers still spin, as the laundromat still fully functioning. Church featuring "high Victorian gothic" architecture. Built as a home for the Union Porcelain magnate in 1867, now the Greenpoint Reformed Church and home to a ceramic mystery. Where one of Greenpoint's "five black arts" was practiced. Neoclassical bank designed by NY architects Helmle & Huberty. Walk through a restaurant's refrigerator door to reach this hidden bar. The enormous 250-room Vanderbilt mansion conceals hidden doors and secret passageways. This Manchester laundromat is hiding something. An unassuming secret door once led to a legendary watering hole.